This is my third visit to Eritrea in 2006. Eritreans think I am rich, Ethiopians fans of these web pages think I am an Eritrean government groupie paid by the Eritrean authorities. But reality is so very simple: my mother, too old to travel herself, and proud of what I am doing, gave me a free Lufthansa ticket to Asmara. In Holland the gifts are usually exchanged on December 5, and to fit the trip into my employers time schedule, the time span on the calendar on the left is the only logical choice to spend my remaining 2006 holidays. So I will make it a trip easy to get and hard to forget, by instead of refusing this generous gift, planning a trip that will also benefit the five blind children of Mr. Mohamed Nur Abubeker in Afabet and an organization called "Foundation Seniors in Eritrea", supporting an old people's home in Mai Habar. And there is some budget for my wife's families and the poor in general in Eritrea. The first day, as usual, is for the red tape, agenda and family. Since a tourist is not supposed to visit Afabet, I need a letter of recommendation from the PFDJ *) office as an addendum to my travel permit of the Ministry of Tourism. The fax from the Eritrean embassy in The Hague did not reach the proper desk, so an extra visit to the Ministry of Foreign Affairs is needed. I explain my situation, and show the documents (in Tigrinya) about the fund raising campaigns to the secretary of the Ministry of Foreign Afairs. When I show her the pictures of my last two visits, the recommendations are virtually done after some phone calls, but since the paperwork will involve two ministries and the PFDJ (check, check, double check), and none of them will work in the weekend it will not be until next Monday that I will receive my travel permit including a permit for Afabet. At the PFDJ office, the secretary informs me about the Nigdet feast. Each Orthodox Church has a particular day during the year when a Saint's day is celebrated. 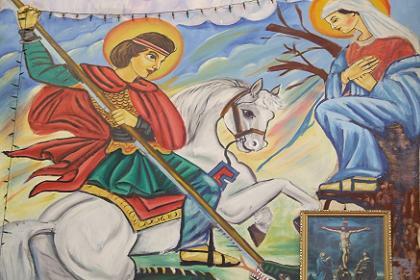 For the Nda Mariam Orthodox Cathedral this is November 30, for the Saint Georgis Orthodox Church, not far from the PFDJ office, it is today, November 16. Actually I am a bit too late to witness the celebrations that took place this morning, but the priests invite me into their church. 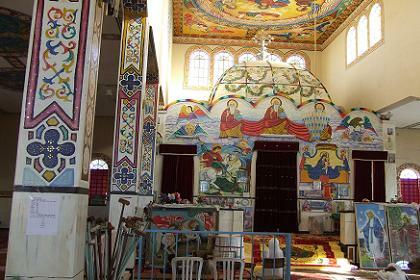 I take off my shoes and follow the priest, who shows me his church, gesticulating, with a few words in English to explain about the beautiful paintings on the walls and the ceiling of the building. 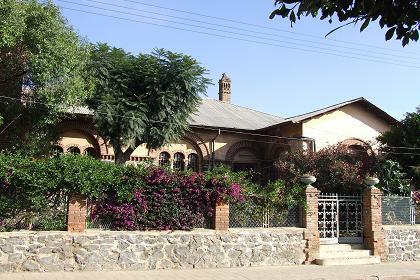 When I walk from Gejeret to the center of Asmara, I almost pass the house of Almaz mother by coincidence. She fell and broke her leg very bad early this year. 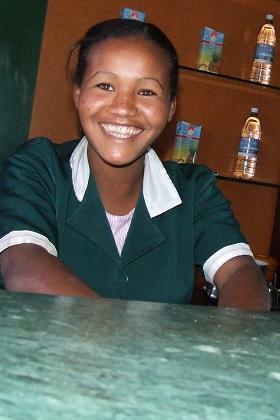 she is very old and Almaz gave me a letter with a financial contribution. There is family to take care of her, but life is hard if you are handicapped like this. So she is very happy that I visit her a third time this year. "You are like Almaz brother", she compliments me. In Tigrinya of course, and her family translates. We drink tea and I am invited to eat injera, oranges, dates and grissini. In the Cathedral Snack Bar I enjoy a mixed fruit juice and a cold milk to complete my diet for today. I hand the girls some copies of the sneaky pictures I made in May this year. They are happy and instead of hiding for my camera, they pose as if they were my family. Mereb Street / Rahayta Street - Gejeret Asmara Eritrea. 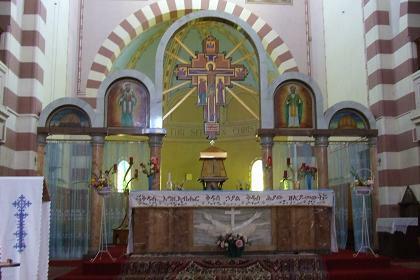 San Francesco Catholic Church (interior) - Asmara Eritrea. Residential buildings surrounded by bougainvillaea - Gejeret Asmara Eritrea. 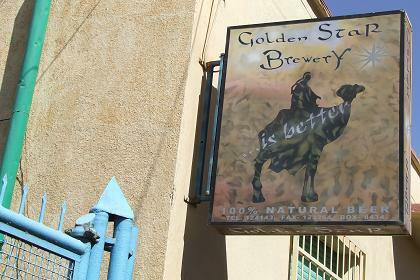 Golden Star Brewery - Gejeret Asmara Eritrea. 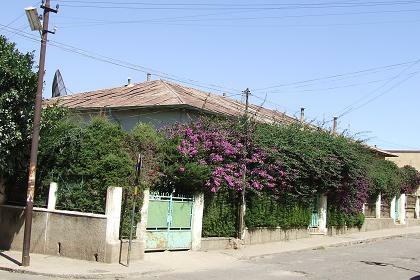 Residential buildings - Villa Quarter Asmara Eritrea. 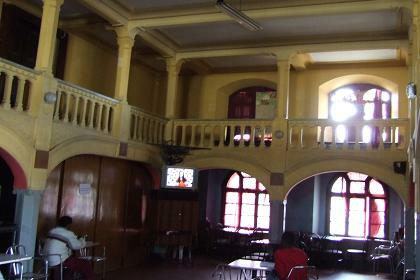 Cinema Asmara (interior) - Harnet Avenue Asmara Eritrea. 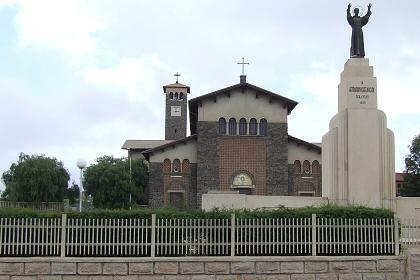 Saint Georgis Orthodox Church - Gejeret Asmara Eritrea. 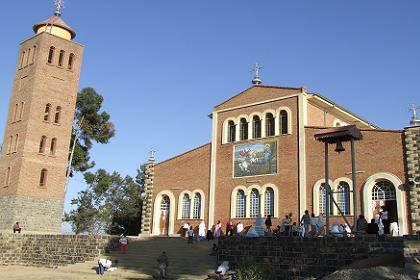 Thebe - Cathedral snack bar - Asmara Eritrea. *) People's Front for Democracy and Justice, the ruling party in Eritrea.